GIANT SPIDER TARANTULA PENDANT TALISMAN NECKLACE - Halloween Gothic Costume Jewelry - GREEN - Huge, Rubbery, Plastic Toy Charm. Creepy cosplay costume accessory for any witch, warlock, sorcerer, voodoo priestess, witch doctor or evil queen! Approx. 3-inch (7.5cm) Tall x 4-inch (10cm) Wide, on 24-inch (60cm) long Black Satin Rattail Neck Cord, with approx. 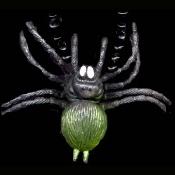 24 glitter and solid black acrylic beads (12 on each side of spider). Choose your bead and cord color! *Please Note: We will send bead, cord color and length as described, if no options are chosen.